Maruti Wagon R price in Hyderabad starts from Rs. 4.29 lakh (Ex-showroom). Wagon R is available in only 14 variant. 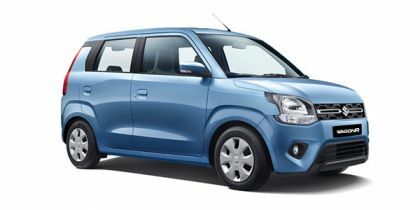 Maruti Wagon R's top competitors are Hyundai Santro (price starting at Rs. 3.90 lakh in Hyderabad) and Maruti Celerio (price starting at Rs. 4.41 lakh in Hyderabad). Share your experiences with Wagon R 2019? Q. Which variant of Wagon R model is best and what is the exactly price of Wagon R on road? Q. Is wagonr best car under 6 lakh? Q. How is the overall experience with the car? Is it worth buying in its segment or any other car is recommendedand how much is the mileage? Q. Which one has higher price and comfort between Ignis and Wagon R? Q. Mujhe 5 lakh tak car leni h, Wagon R best h ya koi or? Q. I am looking to buy my first car and an confused between the new 2019 Wagon R ZXI AGS, VXI 1.2 optional AGS and Tata Tiago XZA version with in the budget under 6 lakhs. will be sent for moderation. These questions and the calculations thereon resulting in specific data are developed and based on certain tools and calculators that are made available to Girnar Software Pvt. Ltd. and are based on pre-determined presumptions/assumptions. Girnar Software Pvt. Ltd., while providing and developing these tools, has relied upon and assumed, without independent verification, the accuracy and completeness of all information made available to it from public / private sources and vendors or which has otherwise been reviewed by Girnar Software Pvt. Ltd.
Top 5 Car News: Hyundai Venue First Impressions, 2020 Creta Unveiled; Kia SP2i Spied, And More! Confused about Maruti Suzuki Wagon R?